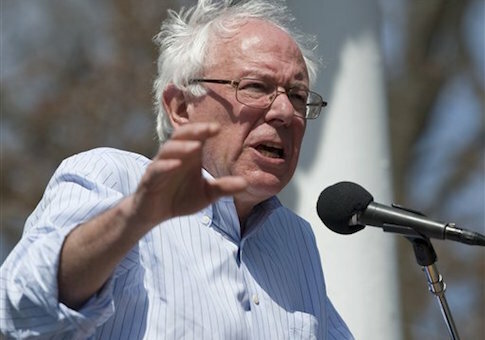 Presidential candidate and self-identified socialist Senator Bernie Sanders (I., Vt.) expressed his concern over Americans who have dropped out of the labor force, saying "real unemployment is 10.5 percent," at a presidential campaign rally in Portland, Maine, the Daily Caller reported. "When you talk about the economy, we also have to have an honest assessment of unemployment in America," said the senator. "Once a month the government publishes a set of figures, and the last figures they published said that official unemployment was 5.4 percent." "But there is another set of government statistics and that says that real unemployment, if you include those people who have given up looking for work and the millions of others who are working part-time 20, 25 hours a week when they want to work full-time, if you add all of that together, real unemployment is 10.5 percent," said Sanders. Sanders also focused his remarks on youth unemployment, citing unemployment rates for 17 to 20 year olds. "But let me tell you something that is even more frightening and is an issue that we don’t talk about at all," he said. "That is the tragedy in this country of youth unemployment." "And I don’t care if no one else talks about this issue, we will talk about this issue and here’s why," Sanders continued. "For young people, who have graduated high school or dropped out of high school who are between the ages of 17 and 20 if they happen to be white, unemployment rate is 33 percent. If they are Hispanic—unemployment rate is 36 percent. If they are African-American—real unemployment rate for young people is 51 percent." "In other words what we are doing is turning our backs on an entire generation of young people who want to get a job, they want to earn some income, they want get out of their homes—they want to become independent and we are not allowing them to do that," he said. The Obama administration often touts the nation’s official unemployment rate, which measures the percentage of those in the labor force that does not have a job but has actively looked for one in the past four weeks. On July 2, 2015, when the latest unemployment numbers were released from the Bureau of Labor Statistics (BLS), President Obama praised the economy in his remarks to the University of Wisconsin. "Now, this morning, we learned that our businesses created another 223,000 jobs this month," said Obama. "And the unemployment rate is now down to 5.3 percent. Keep in mind, when I came into office it was hovering around 10 percent. All told, we’ve now seen 64 straight months of private sector job growth, which is a new record." Many, like Sanders, disagree that the unemployment rate tells the whole story, as the measure doesn’t account for those who have dropped out of the labor force. Gallup CEO Jim Clifton has called the unemployment rate a "lie" and said it is misleading. "There’s no other way to say this," said Clifton. "The official unemployment rate, which cruelly overlooks the suffering of the long-term and often permanently unemployed as well as the depressingly underemployed amounts to a big lie." This entry was posted in Politics and tagged 2016 Election, Bernie Sanders, Unemployment. Bookmark the permalink.